It’s said you always remember your first. I know I do. It was Thanksgiving 1991. Turkey preparations were in full swing, and I had carefully meandered away from the kitchen, surmising (correctly) that my bottom-rung cooking skills would not be in great demand. And there they were on the television: silhouettes of a guy and two little robots watching—and mercilessly mocking—Pod People. Some people prefer Mike as the host, younger viewers may choose Jonah, but I was always a Joel man, and I’ve never been happier than when I was standing beside him, getting our picture taken at the cast party for Mystery Science Theater 3000: The Return. (#humblebrag) The dark years left their mark, however—that long stretch between Diabolik and Reptilicus left me hungry for any and all MST-related material. Cinematic Titanic and Rifftrax are terrific in their own right, but it just wasn’t the same, and even the 14-episode Netflix revival has hardly slaked my thirst. 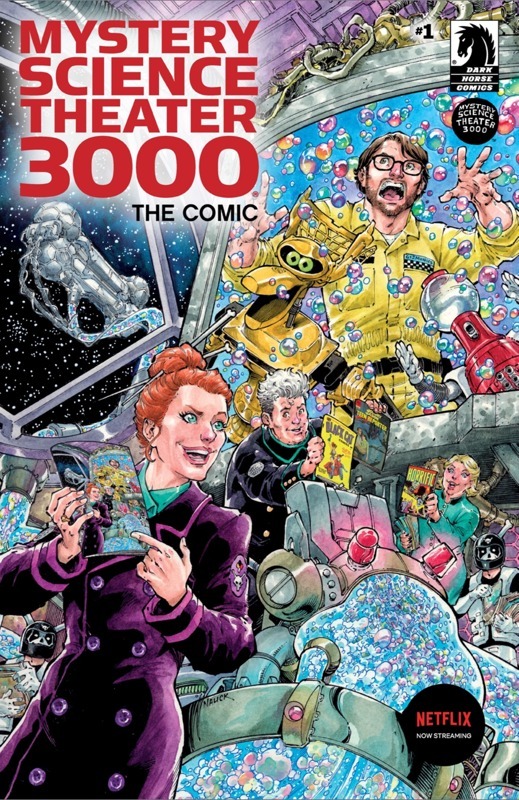 Which is why I was so excited to hear about Mystery Science Theater 3000: The Comic! Released by Dark Horse Comics, issue #1 hit both digital and real-world stands on September 12. (If you prefer a physical copy but don’t know where your nearest comic book shop is, Dark Horse has a zip-code-based locator.) You can tell the publisher is really entering into the spirit of things—they’ve even put the MST3K silhouette over their scrolling comic previews. The comic, like the show, is very much a collaborative effort. In this case, the writers/riffers are Harold Buchholz, Joel Hodgson, Matt McGinnis, Seth Robinson, Sharyl Volpe, and Mary Robinson. Two artists were deployed: Todd Nauck, who drew the host segments and the cover, and Mike Manly, who drew the “in-comic” parts. Wait, host segments? In-comic? What the heck is going on? The “main” story is that Kinga Forrester, daughter of Dr. Clayton Forrester and self-proclaimed Queen of All Media, has a new invention. The Bubbulat-R is a step forward for the forces of Forrester: rather than simply inflicting terrible movies upon unwilling subjects, this new machine actually takes its victims and stuffs them into the pages of a comic book. The subjects are able to riff dialogue into existing characters’ mouths while also appearing beside them to make their own contributions. It’s an interesting conceit, and a clever way to broaden the scope of MST-style riffing. The first comic chosen for the experiment is an issue of Johnny Jason, Teen Reporter, and just like the movies chosen for the MST3K show, the original comic here is largely terrible—boring, trite, and banal are pretty much what you would expect from most comics titled Teen anything, and in that sense at least, this story does not disappoint. The riffs, where they mimic existing characters’ words or thoughts, are denoted by an unobtrusive circle on the edge of the containing balloon. It’s a subtle and effective method of insertion and, to me, preferable to the panels in which the bots are supposedly “physically” there. The art for the “host segments” is adequate, and most of the human characters closely resemble their television versions with the exception of TV’s Son of TV’s Frank, who isn’t as close to Patton Oswalt as might be expected. Each of the host panels is worth examining closely for subtle jokes: technician Ardy suited up on the moon’s surface holding a tattered MTV flag; Crow assembling the tower of Barad-dûr out of toothpicks; the bumper sticker that reads “Repitilicus is Silly!” The art for the “in-comic” section, however, is a perfect reproduction of a 1950s comic, to the point where I can’t tell whether they redrew the original comic from scratch with MST3K characters inserted or simply did a fantastic job of pasting all the bots indistinguishably in place. The riffs weren’t always laugh-out-loud funny, but with many jokes per page, there are hardly any that go by without at least raising a chuckle. Similar to the show, the relationship between Kinga, Synthia, and Max (né TV’s Son of TV’s Frank) aren’t as well polished as the simpler dynamic between Dr. Forrester and Frank; hopefully that’s something that will improve with time. Overall, despite these teething issues, the team did a great job. I thoroughly enjoyed it, and I’m definitely looking forward to issue #2, which comes out October 24, 2018. *Not really, obviously. And if you haven’t seen “Pod People,” just go watch it now. You’ll be glad you did. Martin is a geek from way back and a freelance writer since quitting his day job in early 2017. He has been active in the Minneapolis film and theater scene as both an actor and a playwright.